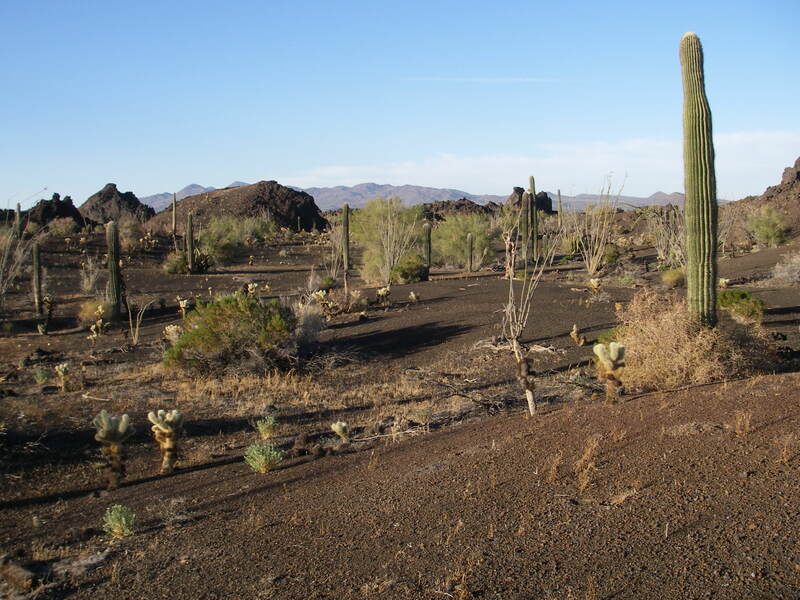 Saguaro cactus (Carnegeii gigantea) are rarely seen in the middle of wide open space. Instead, in the Pinnacate lava flows where this photo was taken, plants cluster, growing up under an adult which shelters delicate seedlings. With all the conflicts in Egypt, Libya, and Wisconsin these last few weeks, I figure it’s time to briefly bid farewell to the little doom cloud floating over me and write about something entirely different: positive interactions. The Sonoran Desert is a pretty harsh place. I myself am already cursing my stupidity in setting up a field study that requires me to spend summers in Arizona instead of somewhere pleasant, like Colorado or Montana. The heat and dryness is not so nice for little plants, or little mammals, like the furry-tailed woodrats or docile and bouncy kangaroo rats. Unfortunately for the Sonoran seedlings, the way rodents deal with their thirst is to eat off the juicy, green stalks. So between the sun, the drought, and the animals, desert plants have things pretty tough. Okay, none of this has sounded like anti-doom cloud so far. Maybe because it’s 10 pm Friday night and I’m in my underground office, taking a break from work to write this blog. But this is where nurse plants come in, and they are nice. If you have ever seen a saguaro cactus in its natural habitat, you will notice they are seldom growing out in the open by themselves. No, there usually lies near their majestic base the remains of a smaller shrub that sheltered them from the sun, increased the moisture in the soil, and hid the tiny, soft-spined cactus from the creatures that would devour it. Some scientists named Brad Butterfield, Julio Betancourt, Ray Turner, and John Briggs recently studied how plants help one another out as nurse plants in Arizona. They found out that this is actually kind of a big deal for how populations grow or shrink here: adult plants shelter juveniles, helping them get established. The more it rains, the more these nurse plants help the little babies. Of course, the downside is that all these little plants that germinate and establish then compete to the death with one another and their former nurse. But the facilitation – the positive interactions of plants sheltering one another – helps to protect the populations from the extreme variability of the weather and climate. Want to know more about facilitation? Check out this paper by Jan Bowers and Elizabeth Pierson on how saguaro and other Sonoran Desert superstars get their start, or this more mathy one by R. Diaz-Sierra, M.A. Zavala, and M. Reitkurk. NPR had a story yesterday about a fish called tomcod that are evolving to better survive the highly polluted environment of the Hudson River in New York. There are a lot of PCBs (stands for poly-chlorinated biphenyl) that end up in the Hudson. These molecules mimic hormones (substances in our bodies you can take pills for, like melatonin or estrogen), but don’t actually perform the roles of hormones. They are therefore called endocrine disruptors (or EDs). This story is a happy one for the tomcod – they’re surviving! There are downsides, though. The allele that makes them more resilient to PCBs makes them more sensitive to changes in oxygen or temperature. If you have ever had a pet goldfish, you know that matters to fish. It also means the PCBs can build up in the fish, which get eaten by other, larger fish, which find their way to sushi bars. Unfortunately, PCBs don’t seem to be good for people. A new paper in the journal Science explains the molecular mechanisms of how these survivor fish do their thing. Okay, this post isn’t strictly about my research, but it is about the other important step of science – getting the word out about what you found! Next year, I will be supported in my graduate studies by the BioME fellowship, in which I will be teaching biology in a K-12 classroom. The actual grade is still TBD until June, but will probably be middle school. I volunteered for middle school because the Arizona state curriculum calls for topics that fit my research interests about then, but also because it’s a really important time in life for most people. For me, it was absolute hell, the low point of my entire life. Maybe that’s why I want to be there – I have some idea I can do it all over again, like Billy Madison. Whatever. I believe that education is like running a marathon or writing a novel: you do it one step at a time, write one word at a time. Considering the whole of a curriculum for an untrained teacher like me can be overwhelming. But I recall a quote by St. Francis of Assisi, of all people: “Start by doing what is necessary, then what is possible, and suddenly you are doing the impossible.” I imagine taking one stride, then another. Soon a whole training run has passed. One word, then another, form a sentence which grows into a chapter. If I start by coming up with one concept, then an activity, soon – I hope – a lesson plan with take shape. Never losing sight of the big picture, tackling the planning day by day will grow to be a year of lessons. Some days, one step may be just patiently coaching one student to finish an activity, giving her extra time to finish. Some days it may mean flashing the overhead projector around the ceiling or licking a dirty whiteboard eraser just to recapture the attention of sleepy students after lunch. When I was in gradeschool, each assignment became its own challenge measuring success. I had to learn to read words, then sentences, then whole stories. In math classes, those seemingly interminable multiplication worksheets paid off with the ability to easily calculate tips and discounts in daily life. While everyone has their own stride, some habits are less useful than others. There may be no right way to run or to learn, but there are unproductive ones. Those lead to dead ends and injury. It is as true for the students as for the teachers. For a struggling kid, every assignment that comes back with a failing grade stabs with the pain of a knee injury in mile 20, whether anyone can see it or not. All those individual steps may sound intimidating, but I find comfort in them. It means that tripping up on any one step will not define the journey. For example, my Junior High math teacher, Mr. Peterson, stepped into a pothole one day. As he walked us through a story problem in our Geometry text book, he paused to mock the name the authors had chosen: Melvin. As soon as he returned to the problem, a girl named Melanie raised her hand. “My dad’s name is Melvin,” she said when called on. Mr. Peterson considered this for a moment. “Is he a big guy?” he asked. Our teacher returned to the problem at hand, but before turning us loose with a problem set, he remarked that the name Melvin was growing on him. “I might even name my next kid Melvin,” he said. Whatever Melanie’s dad’s name was, Mr. Peterson survived to tell the tale and I would swear he was the best math teacher I ever had.